This free to play iOS and Android Clash of Clans type game is based on the characters from the DC comics Batman universe. It is set before the events of Arkham Asylum and the objective is to rule Gotham City by becoming the city's next crime lord. 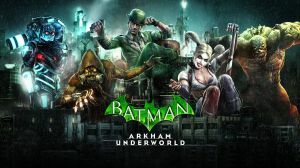 Players take control of super-villains such as The Riddler, Killer Croc, and Harley Quinn as they build their hideout and recruit and train henchmen to help them in their quest to secure this status which involves battling through story missions within Gotham City's neighborhoods to ultimately face off against the Batman.